With winter wheat harvest started, speculations about yields and production are in full swing. This week’s post – “The 2018 Wheat Yield Guide”- takes a look at historic wheat production to provide insights and benchmarks for the 2018 crop. With calendars flipped to June and winter wheat harvest started, speculations about wheat yields and production are in full swing. Following our earlier 2018 yield guides for corn and soybeans, this week’s post considers historical wheat yields to provide insights and benchmarks for the 2018 wheat crop. There are several classes of wheat grow in the U.S., so talking about the wheat crop can quickly get complicated. Figure 1 shows the annual U.S. average yield for winter wheat production since 1960. 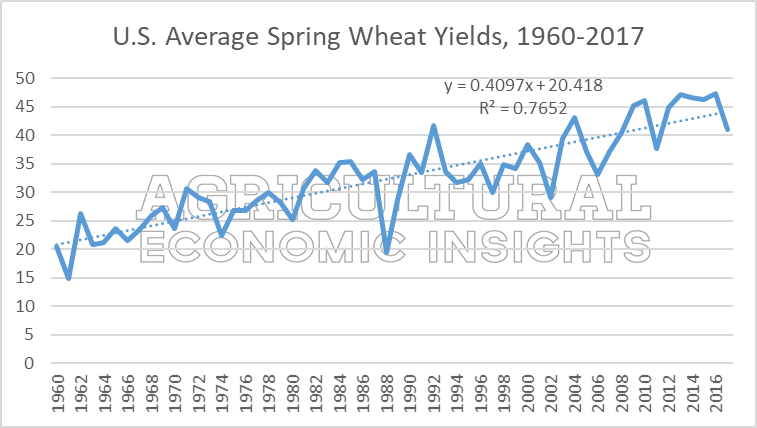 Over the last 58 years, winter wheat yields have trended higher at an average annual rate of 0.39 bushels per acre. Contrary to corn and soybeans, which have observed a string of above-trend yields in recent year, winter wheat has experienced both strong and disappointing yields recently. Figure 1. U.S. Average Winter Wheat Yields, 1960 to 2017. Table 1 shows the data from Figure 1 in a different format. Take a close look at recent yields. In 2014 and 2015 the U.S. average yield was more than 5 bushels below trend. On the other end of the spectrum, the national yield in 2016 –reported at 55.3 bushels per acre- was 6.6 bushels above trend. Trend average yield for winter wheat in 2018 is 49.4 bushels per acre. The USDA’s May Crop Production estimated the winter wheat crop at 48.1 bushels per acre. This is to say that, at present, the USDA is expected the 2018 winter wheat crop to be 1.3 bushels per acre below trend. Table 1. U.S. Average Winter Wheat Yields, Trend Yields, and Departure from Trend, 1960 to 2017. What Might 2018 Have in Store? Table 2 presents the annual departure from trend – shown in Figure 1 and Table 1- ranked from lowest to highest. This provides a way of comparing yields over time. Table 2 also shows the annual departure from trend added to the 2018 trend yield of 49.4 bushels per acre, providing insight into what historical departures from trend might suggest 2018 could have in store. 2015 and 2014, which were noted earlier for disappointingly low yields, are among the worst years for U.S winter wheat yields. At 5.8 bushels below trend, 2015 is the lowest departure in nearly 60 years. On the other hand, 2016, at 6.6 bushels above trend, was the best yield observed in the dataset. It is sort of surprising to think the lowest and highest departures from trend were back-to-back years (2015, 2016). While above-trend yields occur more than 50% of the time for corn and soybeans, this is not the case for winter wheat. The dark horizontal line in Table 2 splits the 58 years of data in half. More than half of the observations are negative. Specifically, winter wheat yields are below trend 52% of the time. Table 2 also allows us to make a meaningful comparison to the USDA’s May winter wheat yield estimate of 48.1 bushels, or 1.3 bushels below trend. That yield would be ahead of 1976 yield of -1.6 bushel from trend. More specifically, 1976 is the 21st lowest observation in 58 years, of the 36th percentile. In other words, yields have been worse than the current 2018 yield estimate about 36% of the time. It’s worth noting the range of yields shown in the third column of Table 2. Again, this shows the historical departures from trend when added to the 2018 trend yield. This is to say that historic winter wheat yields, in 2018 terms, have ranged from 43.7 to 56.1 bushels per acre. It would probably surprise many that a 30-something national yield for winter wheat – while not impossible – is not very likely in 2018. While the national yield hit 38.2 bushels in recent memory (2002), the upward trend in yields over time makes that 2002 yield more like 44.4 bushels per acre today. Table 2. U.S. Winter Wheat Yield Departure from Trend, 1960 to 2017. The upward trend in yields makes meaningful comparisons over time difficult. More importantly, the upward trend also makes it hard to think about reasonable yield expectations in 2018. For example, a sub-40 bushels per acre yield for winter wheat in 2018 is historically unlikely but was an observed yield just 16 years ago. In recent years, winter wheat yields have ranged from the most negative departures from trend (2015 and 2014) to the most positive departures (2016). It’s been a wild ride for wheat yields! In May, the USDA estimated the winter wheat crop at 1.3 bushels below trend; a yield exceeded about 64% of the time since 1960. For those interested in these data for spring wheat, the figure and tables can be found here, here, and here.